I can’t imagine there are too many people who don’t remember their first impression of a dolphin as being one of wonder and joy. It is somehow reassuring to find that such magical beings exists. They just seem to emanate happiness and a love for life. I know that’s how it was for me when I first saw dolphins at Marine World when I was a child; and then whether it was Flipper or the Cousteau Documentaries, I was just completely enthralled by them. It was quite a few years before I found myself in a position to be aroun them in their element… The Ocean World. photo credit: Smithsonian Institute Whether up close, as they race with the bow of the boat or put on their acrobatic show of leaps and aerial spins in the wake (revealing the pink undersides of the young spinner dolphins), or from a distance, it’s just a wonderfully inspirational sight to behold! Sometimes they would continue the surface acrobatics from a short distance away after we had moored at the dive site, always to the great pleasure of all on board. I mean a day of diving is pretty much a happy affair to begin with, but when the dolphins are around there’s just that something extra that everyone aboard seems to feel. 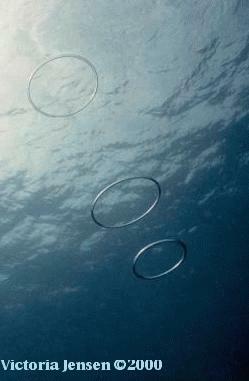 “air ring” was during my basic open water dive class. My friends and I had just finished practicing some of our skills in a sand patch off “City of Refuge near Kealakekua, and the instructor casually took his regulator out of his mouth, leaned his head back, pursed his lips and “poohfed”. Out came a beautiful, perfectly circular, silvery ring of air! Since air expands as it ascends, it became larger and thinner as it rose, disintegrating into thousands of tiny bubbles as it touched the surface. 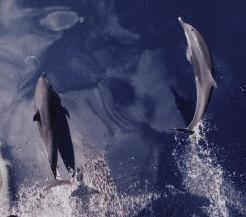 There was a scientific meeting on dolphins somewhere around 1984 or ’85 in Kona, Hawaii that was attended by a lot of residents, especially divers. 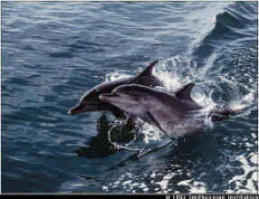 The subject of dolphins “playing” came up. 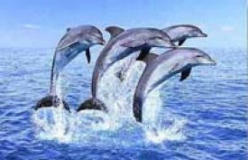 One of the scientists, in a rather authoritive tone, stated that there was no scientific evidence that dolphins play. A bit of a chuckle went around the room and one of the dive instructors who attended proceeded to tell him of some of the things many of us had observed such as tossing a plastic grocery bag back and forth between “players” like something between “catch” and “keep away”. by M.Herko I sort of felt sad for the scientist. I didn’t know if he was so used to getting conditioned responses in a controlled environment that he’d missed out or what. I just recently came across an article that was published a couple of years later that put a big smile on my face. It was confirming that dolphins do “possibly” play and the way it is written, I suspect that meeting may have had a little to do with it. Out of the tank and into the wild blue? 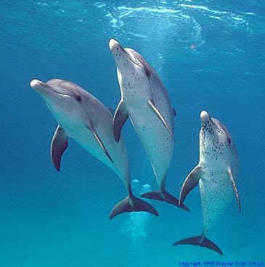 Dolphins can stay submerged for 8 to 15 minutes, but 2 to 5 minutes is average. 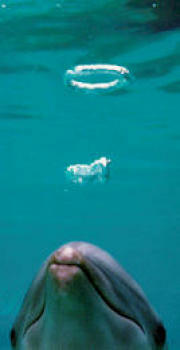 They usually sleep on the surface with their blow holes exposed for breathing. They only doze for a few minutes at a time because they are conscious breathers which means they must be at least semi-conscious to blow water out of the airway before taking a breath. Spinner dolphins feed during the night in the open ocean and come near shore during the day to rest and frolic and make love, which they seem to do pretty frequently. 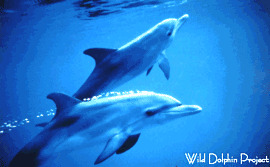 Dolphins are sexually active all year ’round but the females are only fertile during spring and summer. 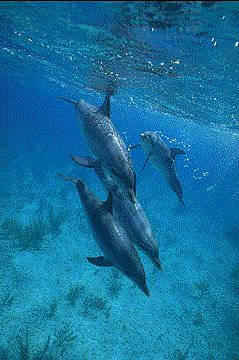 The family unity and affection dolphins have for one another is unmistakable. 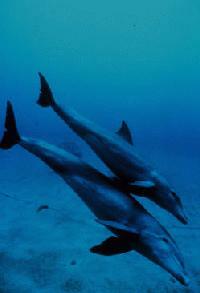 The female dolphins bear children about every 2 to 3 years. 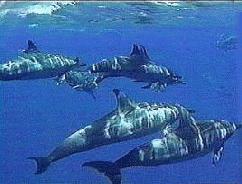 When the mother-to-be is about to give birth, several dolphins gather around her while one or two “aunties” serve as midwives. Sometimes they’ll tug on the baby’s tail to help it out and then the mother and the “aunties” will guide the baby to the surface for its first breath. Nursing will last for 12 to 18 months, but they start eating solid food by 6 months.After only one year the calves will grow to be 7 times the size they were when they were born. The mothers are very protective of their offspring, as are whales. 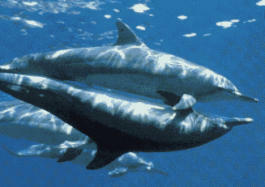 A calf may stay with it’s mother for 5 years or more.The bond between dolphin families and friends is often for life. A lot of the laws made in the ’60s and ’70s to protect dolphins have been relaxed by Congress and thousands of them are being killed again by fishing nets. And then there’s pollution which is a world wide problem. As the the lower creatures of the food chain ingest high levels of DDT, PCBs and other chemical toxins, they become the food for the higher species including whales, dolphins and us. Click on of the “links” button below for more information about marine life and our eco-system to see what we can all do to help solve these problems!